A fortnight ago we looked at a few trades which were entered using the concept of "buying because there are no more sellers"… or "buying because the market can't go down". I've received some requests for another example. And two people asked to see what I'm looking at on the lower timeframe. So let's look at a couple more trades. First though, we've discussed this idea a few times over the last six months or so. If you want to review some of the earlier material, try some of the following. There may be more if you search through the archives as well. 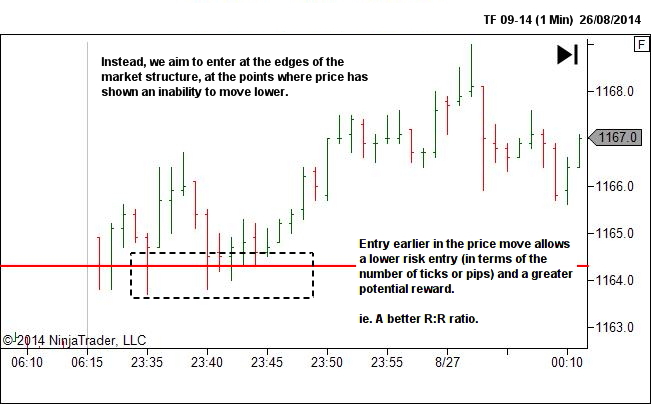 For one more example, let's look to the emini Russell (TF) on yesterday's session, Tuesday 26th of August. Let's back up to the start of the session and get some context from a slightly higher 5-Minute timeframe. Price opened above the S/R level at point A before dropping below the level at point B. 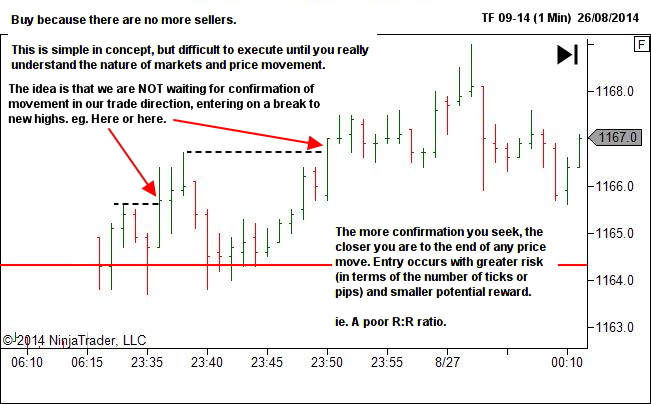 Note on the lower timeframe chart how price stalls and forms a block pattern. There is buying here opposing the initial bearish drive. At point C price breaks from the stall region and rallies, reaching new highs at point D.
The S/R level has held. The opening range has broken to the upside. The bias is up. We are looking for a pullback entry if the trend continues driving higher (First Principle) or perhaps a retest of the S/R level if no trend develops yet (Fifth or Sixth Principle). 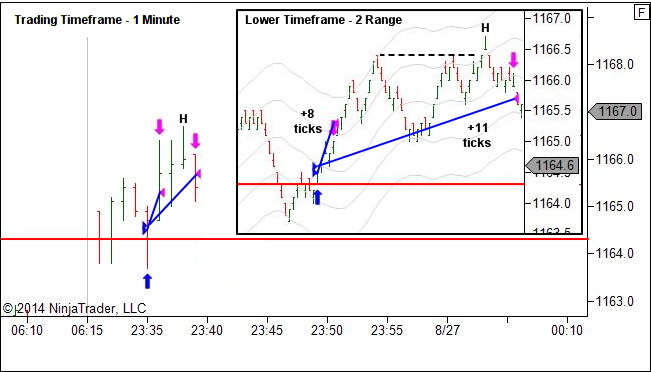 The trading timeframe stalls and price drops back to the S/R level, breaking to new session lows at point E.
Behaviour following the break will provide clues as to the next direction. If my bullish bias is no longer valid then I should see bearish strength in both price and NYSE Tick. 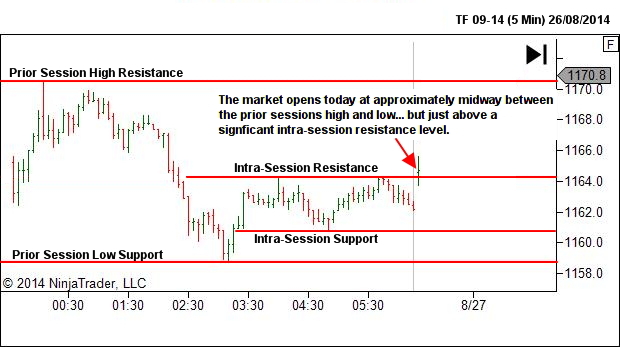 Price should follow through to even lower levels, holding below the S/R level and the prior session low. And the NYSE Tick should show move below zero. This does not occur though. The break only moves one tick below prior lows. And the NYSE Tick, while trending downwards, is actually doing so very slowly and still holding above zero. There are NO signs of bearish strength. 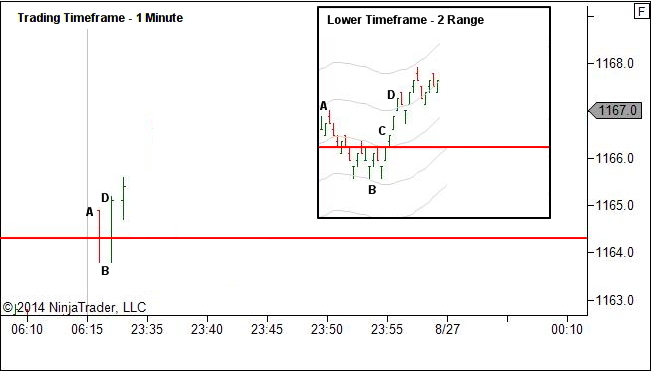 Looking at the lower timeframe, price moves from E to again form a short-term stall at F before then breaking higher at G. This is the entry point. I bought because there were no more sellers. I bought because price could not move lower. 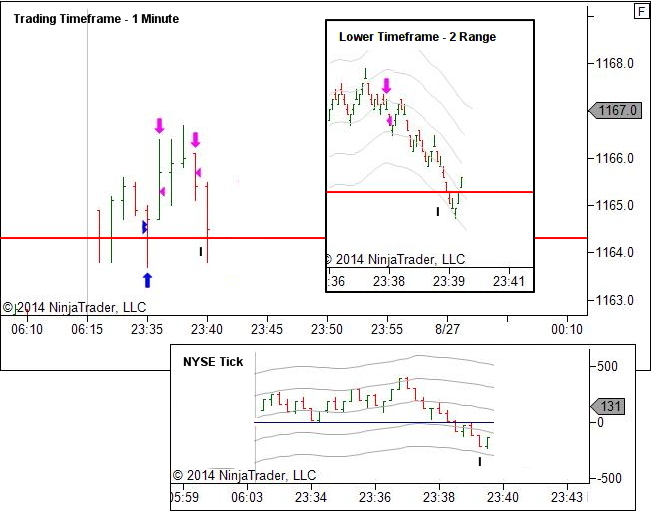 Neither price nor the NYSE Tick showed bearish strength following the break of S/R and session lows. The bias was still up. My thought process… "We have a break of S/R and session lows against my bias"… "Is there any bearish strength in price? No the break has not continued lower and is holding at the S/R level"… "Is there any bearish strength in the Tick? No, it's holding above zero"… "I'll buy on a break back above the lower timeframe stall region. Risk is low and potential reward is much larger." The chart above shows the outcome of the trade. Part one was exited just short of current session highs. Part two was exited via a trailing stop after the break to H failed to hold and price broke the low of the TTF price bar. We look now for the next pullback entry. As shown above though, price pulls back further than expected, providing us with another Break of S/R at point I. Note how the NYSE Tick is trending down. Although it's not at very low absolute values, it has clearly moved below the initial levels held during the first seven minutes of the session. There is potential bearish strength here – from both price and Tick. Entry long requires NO SIGNS OF BEARISH STRENGTH. We wait to see the following price action. As we see above, the potential bearish strength at point I did not lead to any further follow through. Price stalled again at the S/R level (point K) before breaking below that level at J. This new break is interesting. It provides a further opportunity to test for any bearish strength. The price break at J could not hold. And the NYSE Tick at J could not move to new lows. Again… there is no evidence of bearish strength. Entry is taken LONG as the break at J fails. As with the first trade, I bought because there were no more sellers. I bought because price could not move lower. 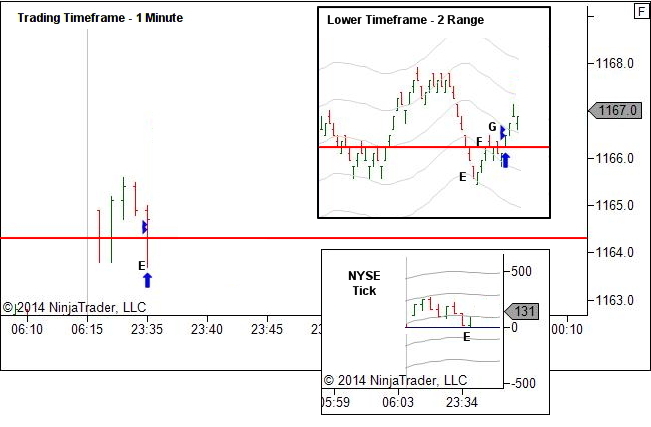 My thought process… "Price and the NYSE Tick at point I suggest potential bearish strength. Let's WAIT and see what happens if price breaks to new session lows. PATIENCE! "… "Price has stalled (K). This is not bearish. "… "We now have a new break against my bias as price breaks the low of K. Let's test this for bearish strength. "… "Is there any bearish strength in price? No the break has not continued lower and is holding these levels"… "Is there any bearish strength in the Tick? No, it's not moving lower"… "I'll buy on a break back above the lower timeframe stall region and S/R level. Risk is low and potential reward is much larger." The above two charts show the outcome. Part one was a lower timeframe scalp. 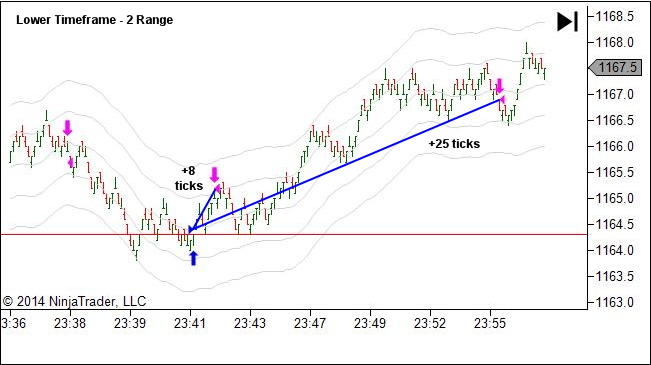 Part two was held, exiting with a trailing stop on the second failure of trading timeframe bars (and occurring just a few minutes before a news release). As mentioned above, the concept is simple. But execution is not initially easy and it takes some practice. However, in both cases it's essentially a breakout failure. If you can identify a breakout failure on higher (slower) timeframes, then you can learn to also see it on these lower (faster) timeframes. In both cases we had price breaking against our bias. Trade one broke to a new session low. Trade two moved down with potential bearish strength before stalling and then breaking that stall. 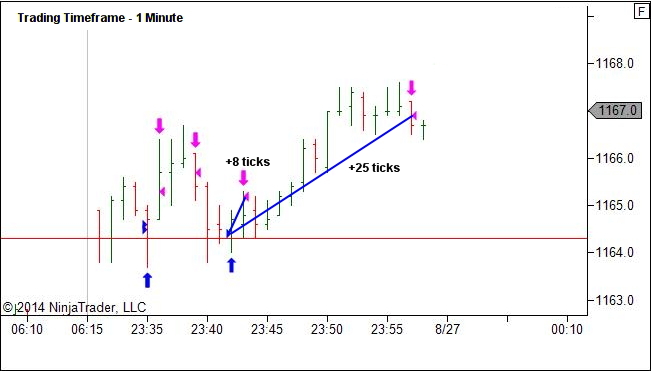 We look to the behaviour following these breaks against our bias. In both cases there was NO sign of further follow through in price. And there was NO evidence of bearish strength in the NYSE Tick. No bearish strength following a break against our bias. How did I know they would work? I didn't. You never do. But the risk is low and the potential reward is much greater. That's a trade I want to take every time – a failed break against my bias with good R:R.
Today we are celebrating “Teachers Day” in India. It falls on September 5th , the birthday of Dr. S Radhakrishnan, an academic philosopher and the second President of India. I salute you on behalf of all Indians who learned the art of “Real Trading” from you. Thank you very much and God Bless You. Thank you Rajesh! Much appreciated. in the 2nd example, the break long between K and J was almost identical to the breaking higher after G in example 1, yet you took the one but not the other, could you please elaborate a bit on your thought process? Sorry for the delayed reply. As per the note in my newsletter, I’ve been on holidays with limited internet availability. The difference between the first and second examples is simply context. 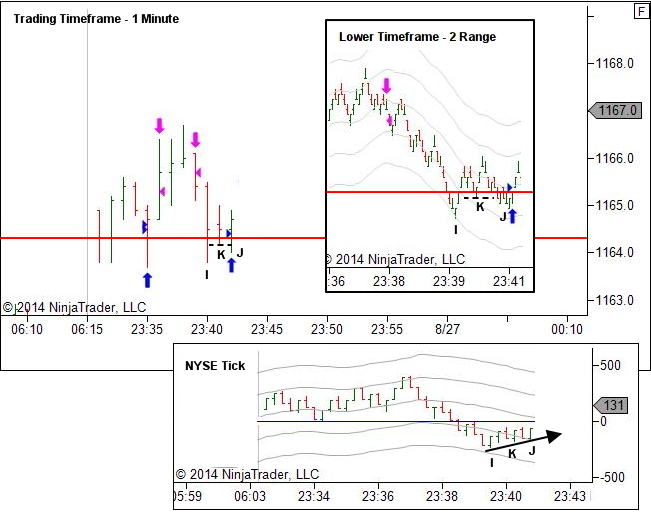 The second involved a deeper pullback with both price and NYSE Tick suggesting potential bearish strength. Patience was warranted here. I’ll rarely take a “first entry” in such a case, rather looking for a good stall and failure of a second attempt to push lower. In addition (and quite important in this case) entry on a break above the I-K region would have occurred in what I call a YTC Scalper retail zone. This is NOT an ideal entry location. The subsequent entry was the better location. Refer to YTC Scalper for more on this.